No matter how advanced technology becomes, visiting a sight with a local guide is still the best and easiest way. Your local experienced guide will be a window to the culture and mentality of the country you visit. He’s your instant fact finder to ask about anything that sparks your curiosity. He’ll tell you about the customs, habits, mores and morals of his people, and explain all the curious things that make his country different from yours. 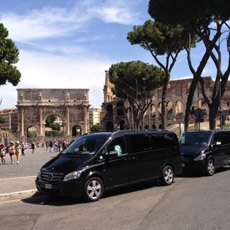 Our fully licensed driving guides in major Italian cities will make your excursion perfect and save you time and effort.He will know the best routes, he will be updated on timetables and opening hours, suggest you authentic restaurants and advise you how to avoid to get ripped off. Most importantly he will tailor a tour to your needs and tastes. He can adapt, delivering a playful tour to a family with children and a fact-filled one to a group of history buffs. After a long plane ride (or before a long plane ride!) it may make a lot of sense to leave the driving to someone else. 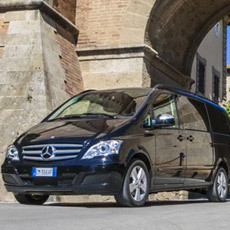 All transfers are for your private group, door-to-door in late-model vehicles with courteous, experienced drivers. Wherever possible all drivers speak English, but their job is to make sure you get to your destination safely. Prices are for one-way transfers, all-inclusive of taxes, gas, tolls, one large bag and one small bag per passenger. Surcharges may apply before 7 a.m., after 9 p.m., or on holiday. 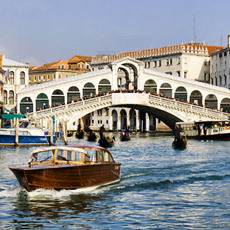 With the city spread across 118 small islands separated by canals, a water taxi is the perfect way to get around in overwhelming Venice, and will provide you with stunning views on your journey.Our english speaking assistant will meet you at the airport, at the train station or at your centrally located hotel and will ensure you reach your destination safely and comfortably. If you wish to make sure the accommodation matches your needs in full, forget about the web and rely on our knowledgeable staff : all the hotels we proposed have been scrupulously inspected by us so that we know the features of different rooms typologies, the hotel location and service quality and can easily find the perfect solution that exceeds your travel expectations. Traveling on a small or large group and want to make sure everything goes right? 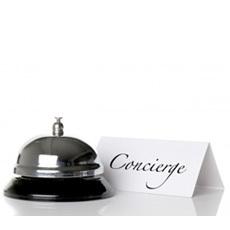 An english speaking assistant is not a licensed guide but a trusted local who knows the area very well and can help with translations, indications on best shops and authentic restaurants and provide you with art and historical background of the area , offering a full time concierge service!